While we have months to wait until Spartacus returns for its yet-to-be-titled Season 3, fans may be interested to know that the cast is hard at work getting into shape for the new season. Unsurprisingly, those toned arms, shapely legs and rock-hard abs are the result of hard work. 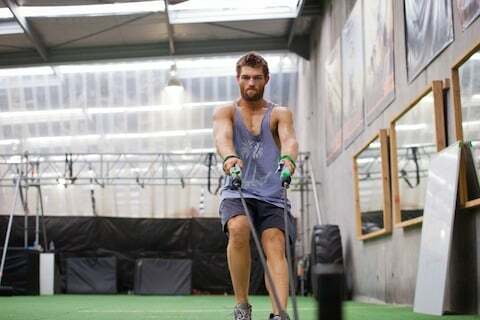 For those who want a glimpse at what goes into Spartacus boot camp, check out these photos! 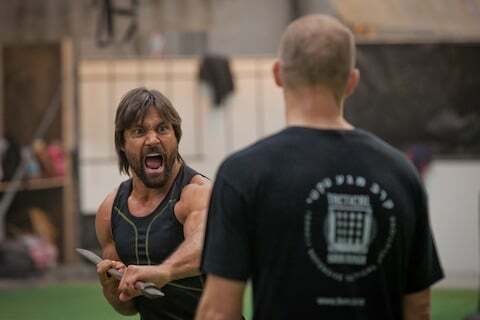 A month ahead of production for the new season, the cast of Spartacus, along with the stunt performers, get together for some intense training to get their bodies into "Gladiator shape." Starz released the following photos of the training. This one has Liam McIntyrle focusing on "sled work," which is apparently designed to strengthen the legs and core. 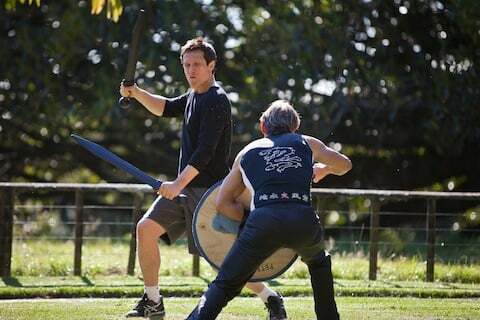 Here's Manu Bennett (Crixus) working with a 200-year-old sword called a Taiaha. According to Starz, he later presented it to Poppleton "out of respect and thanks for training him and the other actors and stunt performers for the last four years." As excellent is the above photo is, especially because it almost looks like Bennett's in character, I think this next one's my favorite. Ellen Hollman, who plays last season's newcomer Saxa (introduced in Vengeance), is doing a bit of people-lifting. According to Starz, she and other cast members "executed the USMC combat fitness test." This includes a 20 meter sprint, leopard crawls and baby crawls. It also includes the "Fireman pick-up," which may be what we're looking at here. When Steven DeKnight spoke with the press after Vengeance wrapped up, he mentioned that Saxa would be featured more prominently in Season 3. Finally, we have a look at Simon Merrells, who's set to play Marcus Crassus in the new season. Like Bennett, he too is working with swords. Even this small glimpse of their training is impressive and offers a bit of perspective. The next time I feel frustrated that the new season of Spartacus is too far away, I may have to default back to these photos to remind myself of just how hard the cast is working to make it happen.